Madison, IL – Custom Steel Processing, Inc, a newly formed flat rolled steel distributor and coil processor, opened a new coil processing and distribution center in Madison, IL, across the river from St. Louis. 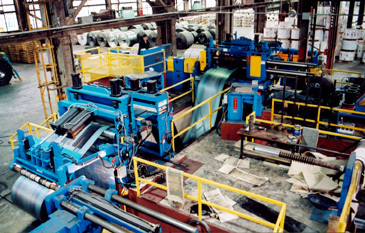 Custom Steel Processing will process and distribute prime quality hot rolled, cold rolled, and coated carbon steel coil to metal forming and stamping OEMs throughout the central and southern United States. Unlike many start-up metal service centers that begin life with second-hand equipment, Custom Steel Processing elected to start as a premium-quality metal service center and equipped its operation with a new custom built state-of-the-art Braner/Loopco coil slitting line. Electing the new equipment route (versus used-rebuilt equipment) assured Custom Steel Processing a predictably smooth operational start-up and gave its customers assurance of a first-rate product and reliable on time deliveries. 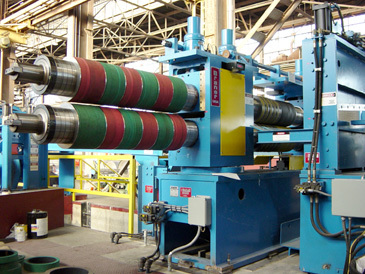 The new Custom Steel Processing slitting line is capable of processing 60,000# x 60” wide coils in gauges from .015” through 1/4”. A 10” arbor x 300 HP Turret Head Slitter and a 250 HP two-ratio Recoiler allows Custom Steel to slit up to 8 cuts in 1/4” and 12 cuts in 3/16” grade 80, and up to 10 cuts in 1/4” and 16 cuts in 3/16” mild steel coils. Lighter gauges from .090” down to .015” are processed in the “single-loop” mode at 1,000 FPM. Faster coil threading due to compact line length and elimination of reverse strip bending during threading. No coil-breaks from "reverse-bending" against the natural coil-set. No deflector roll surface scuffing because all defector rolls are positioned under the strip, not over. Straighter slit coil side walls, the result of a large exit roll wrap angle. Improved productivity from faster threading and better strip tracking. Turret Head Slitter: A Turret Head Slitter with two quick-change 10” x 300 HP slitter heads gives Custom Steel Processing the ability to process 8 cuts of 1/4” x 80,000 min. 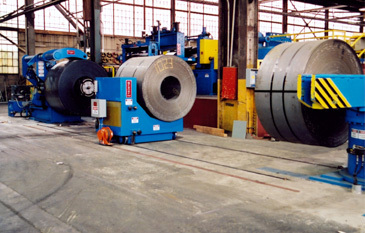 yield hot rolled coil and up to 16 cuts in 3/16” grade 50. Turret Slitters feature “mill-duty” construction; unobstructed access to the slitter arbors to minimize set-up time; pushbutton positioning; and one-minute slitter head exchanges.